The studio of the Italian origin artist Guido Nincheri will be open during the summer season. 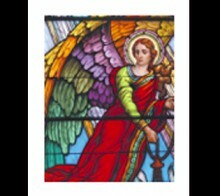 Located on the ground floor of the former offices of the Dufresne Construction and Dufresne Engineering, at 1832 Pie-IX Boulevard, Montreal, Studio Nincheri was one of the largest stained glass workshops in North America and the oldest still existing Quebec. More than 5,000 windows were made there, windows that are found today primarily in churches in Canada and the northeastern United States. Guido Nincheri helped decorate with murals, stained glass windows, frescoes, paintings and furniture executed from his drawings, more than 200 buildings spread over 116 locations in North America. Studio Nincheri will be open from the June 24 to August 22, 2016, Wednesday to Sunday, 9:30 to 5 pm. Free parking is available at the Château Dufresne Museum, located at 2929 Jeanne-d'Arc Avenue.